Step 1 Melt 1 tablespoon plus 1 teaspoon butter in a small, stainless pan over medium-low heat. Add the shallots and cook them until translucent but without browning, about 3 minutes. Add the mustard powder and cook for an additional minute, then add the white wine and lemon juice, scraping any flavoring from the base of the pan. Reduce the liquid by half. Remove from heat and strain through a fine mesh sieve, pressing the shallots with the back of a spoon or spatula to squeeze out any additional liquid. Step 2 Place the reduction back over medium heat and add the cream. Reduce by almost half, 2 to 3 minutes, stirring constantly, then remove from the heat. Whisk the Dijon mustard into the reduction, and add the remaining 2 teaspoons butter and salt. Taste and adjust the seasoning if needed. Strain the sauce once again and cool the sauce in an ice bath if you are not using it immediately. The sauce can be made up to 1 day ahead, covered and refrigerated. Step 4Spoon enough sauce over each oyster to fill the shell completely. Sprinkle each oyster with fresh bread crumbs and then drizzle each oyster with a little melted butter. Bake the oysters for 3 minutes, then finish them under the broiler to brown them. The bread crumbs should be golden brown and the sauce should be bubbling. 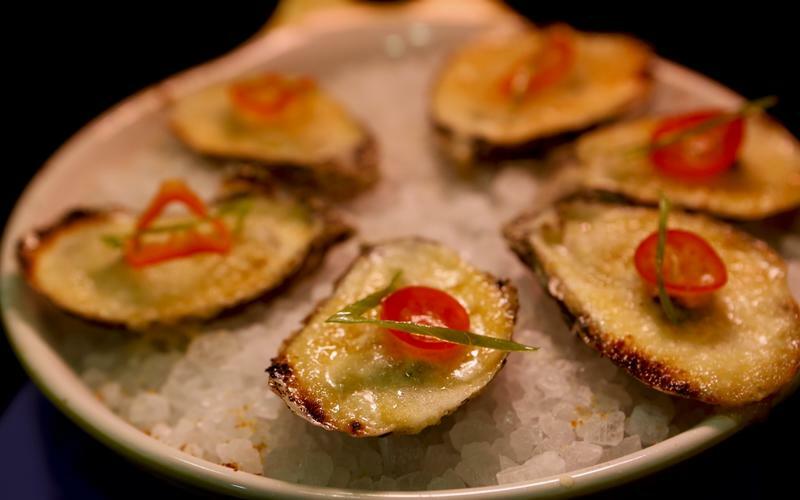 Top each oyster with a very thin slice of scallion green and a thin slice of red jalapeno. Serve immediately. In Recipes-list.com we have selected the most viewed recipes from category - Appetizers Fish and shellfish . Enjoy the best recipes specially selected for you! Deviled oysters is the right choice that will satisfy all your claims.